As we get further into each year we’re looking forward to seeing when the first snow fell. This week photos of snow in the valley turned up in 1982, 15 days later than 2018’s first snow on October 2. Tuesday night craft class – one of the many Adult Education courses currently being offered at the Myrtle Philip School. Left to right: Inge Neilsen, Jenny Busdon, Ruth Howells, Marilyn Willoughby and Kelly Fairhurst. The logging truck that burned near Green Lake on Thursday. Whistler Creek Lodge showing where the worker fell off the roof on Friday. Cartoonist Tom Thomson stands in front of his cabin in White Gold Estates with the sign put up by the Whistler realtors in answer to his cartoon of September 26. Edith Iles (right) makes her speech before giving Gay Guthrie the “Endurance Award”. Fire Chief Lindsay Wilson shows the Myrtle Philip kindergarten class the workings of one of the Whistler fire trucks. The visit was in recognition of National Fire Prevention Week. The town shapes up! The addition of curbs and paving in front of the town centre approach really sets it off against the new snow on the mountains behind. Long weekend parking problem! New curbs create a traffic problem outside the Whistler liquor store on Saturday just before closing. The view of the Whistler United Pharmacy, now open for business in the Blackcomb Professional Building in the centre of Whistler Village. Whistler’s first paved ski area parking lot! Grandview Blacktop crew paves the day skier parking lot in front of the base area daylodge. This giant saw blade decorated and donated by Germaine Degenhardt is one of the prizes to be sold off at the Pemberton Lions Club auction on Thursday, October 23. A Whistler wonderland appeared overnight Sunday, October 17 with the season’s first snow in the valley. DeMolay youngsters take full advantage of the first snow of the season and run through a very crisp game of flag football Sunday. The world was someone’s living room – so who needs a TV when you can sit and watch the crowds stroll by in the municipal parking lot. Newcomers and old-timers enjoyed tea and nibbles at the second annual Welcome to Whistler Tea put on by the Alta Lake Community Club in Blackcomb Lodge Sunday. Whistler Council shows the signs of a gruelling three-hour public hearing held to discuss bylaws for the equestrian centre October 18. Rich Miller outside Granny’s Food Emporium, which will open in Whistler November 1. Pierre Trudeau, insulation contractor, Alpine Meadows. Connie Kutyn dismantles the stage in Village Square that helped feature entertainers all summer long. She and Al Bosse built it earlier this spring. … as their classmates get started in the meet. Winners of the Fire Prevention Week poster contest are, left to right: Madeleine Demries (gr. 3), Nicola Dedeluk (gr. 6), Jocelyn Willoughby (kindergarten) and Rachel Roberts (gr. 5), all students at Myrtle Philip Elementary School. Building a log cabin is traditional work using a minimum number of modern conveniences. David Stary chisels a section to fit precisely the log beneath. Whistler residents were delighted Wednesday to hear of $7.8 million worth of completion plans for the long empty convention centre. Plans for the building include a completely refurbished roof, atrium, theatre and tall, bright banners to orient visitors to its location. Part of the aftermath of last week’s severe flooding in Pemberton. Farmer Tom Kempter lost close to 150 tonnes of hay when flood waters destroyed it last week. Kempter lost two-thirds of his winter feed for his livestock. Tracy Comber was one of the many Whistler volunteers who flocked to Pemberton to help with the massive clean-up job. She helped with cleaning equipment at the flood-ravaged Pemberton High School which sustained about $500,000 in damage. Whistler’s slo-pitch league almost became snow pitch this season, but Stoney’s pulled ahead before the flakes fell and won the championship in the 19-team league. Saturday’s championship game against the Gourmet Rainbow Reefers saw the Stoney’s crew win 14 to 8, and had some observers calling the league the Beer and Whine league by the end. Next year should be another interesting season as the Tapley A’s make their long awaited slo-pitch debut. Left to right: Norm Trottier, Lance Fletcher, Marianne Hardy, Dave Kipp, Paul Liakakos, Tim Malone, Val Jazic, Will Moffat, Sue Christopher, Dave Murphy, Barb Simpson, Wendy Jazic and Ron McCready. Ask about the beginnings of municipal politics in Whistler and two things will unfailingly be mentioned: the year 1975 and the name Pat Carleton. In the early 1970s Whistler had yet to gain a local governing body. The area including Whistler was governed directly by the province and the Squamish-Lillooet Regional District. Change began in 1974 when the province became interested in developing tourism and enacted a land freeze in the area, preventing private land owners from determining the development of the valley for financial gain. Their report concluded that a strong local government was the solution. 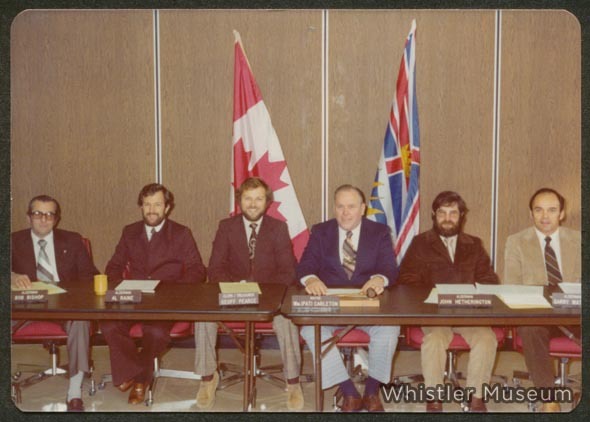 The result was the Resort Municipality of Whistler Act and the creation of a new kind of government in 1975. This new resort municipality was to be unlike any other resort or municipality in the country. Canada had resorts, such as Banff, where a local advisory committee provided guidance to the senior level of government with absolute control over the resort. Canada also had municipalities. Whistler’s new governing body was to be unique. Property owners and residents would elect their own mayor and three aldermen. What made Whistler different, however, was the fourth alderman, appointed by the province to oversee financial isssues and maintain the interests of the province. On September 6, 1975, the first municipal council was sworn into office. The three elected aldermen, Garry Watson, John Hetherington, and Bob Bishop, were joined by Al Raine, the provincial appointee, and these four representatives were led by Whistler’s first mayor, Pat Carleton. Many residents of Whistler gathered to watch the swearing in of their first elected government by Judge C.I. Walker. Some, however, were unable to attend the ceremony due to a last minute change in location. Originally the ceremony was planned to take place at the Roundhouse Lodge on the top of Whistler Mountain. Free gondola and chairlift rides were provided for those who wished to attend, but some Whistler residents decided to take a more active approach. Paul and Jane Burrows had hiked up the mountain with their dog to attend the ceremony, unaware that as they were hiking the ceremony had been moved to the base of Whistler Mountain at Creekside. Paul, president of the Alta Lake Ratepayers Association and founder of the Whistler Question, had run against Pat Carleton for mayor and was looking forward to watching Whistler officially gain a municipal government. Unable to download their dog on a chairlift, the Burrows were sadly unable to get down the mountain in time and missed the swearing in of Whistler’s first aldermen and mayor. Pat Carleton. Whistler Mayor 1975 – 1982. Like many before him, Pat Carleton, a coffee salesman, first came to Whistler on a fishing trip in 1956. He fell in love with the area and built a house on Alpha Lake with his wife, Kay, which the family used for holidays. Pat and Kay retired to their home in Whistler in 1971 and Pat became an active member of the community through the Whistler Chamber of Commerce and the Alta Lake Ratepayers Association. From 1975 to 1982 he served four terms as Whistler’s mayor. From the get-go council faced a daunting task: to build a resort. Their plan was to develop a Town Centre on the dump at the base of both Whistler and Blackcomb Mountains, a goal not made any easier by the valley’s lack of a sewage system and opposition from private land owners who wanted to develop the resort on their own properties. Council had few resources, apart from a gaval presented to the mayor, and no municipal building. Meetings were held in various locations such as the Carleton’s garage and the lunchroom of Myrtle Philip School. Despite these difficulties, the municipal governments under Pat worked endlessly to shape Whistler into the resort it is today. The early development of Whistler did not progress smoothly. Early in 1976 the community of Whistler and Council agreed upon an official community plan which placed the new Town Centre on top of the dump at the base of both Whistler and Blackcomb Mountains. This plan was strongly opposed by private land owners who formed the Whistler Development Association. Council waited and became frustrated as provincial approval of their plan continued to be withheld. After less than a year in office, council members voted unanimously to resign if the province refused to support the offical community plan and Pat Carleton, Al Raine, and Garry Watson travelled to Victoria with their resignations in Pat’s pocket. They met with Municipal Affairs Minister Hugh Curtis who had recently received a delegation from the Whistler Development Association including planners and large fancy model. Luckily, Curtis had been unimpressed by this proposal and approval was given for the plans of the community. Whistler’s mayor returned home with the resignations still in his pocket. 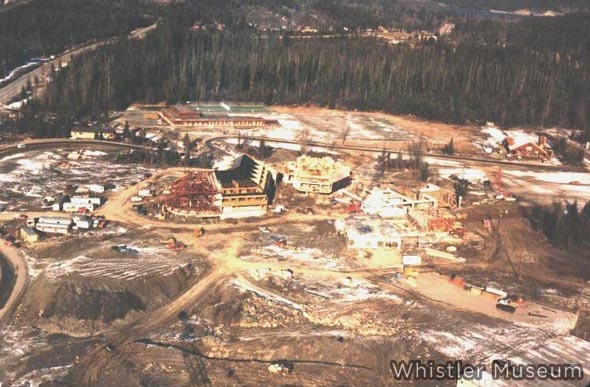 Early stages of Whistler Village construction, October 1979. The first seven years after the incorporation of Whistler as a resort municipality saw dramatic changes to the area. On August 21, 1978, Pat turned the first sod on the Town Centre site and the construction of today’s Village began. By then the problem of a sewage system in the valley had mostly been solved in 1977 with the opening of Whistler’s first sewage treatment plant. At the official opening of Blackcomb Mountain in 1980 Pat was there to do the honours. The early work of Whistler’s first council and its first mayor was instrumental in creating the resort that Whistler is today. In September of 1982 Pat Carleton announced he was not going to seek re-election and was succeeded in December by Mark Angus, Whistler’s second mayor.